Julius Malema, the leader of South Africa's opposition Economic Freedom Fighters (EFF) called the Zimbabwe government "backward" and "barbaric" for shutting down the internet after deploying soldiers to quell fuel price protests. Malema described Zimbabwe President Emmerson Mnangagwa as a "fool" who did not "deserve my respect" for authorising the military crackdown that has left at least 12 people dead and over 300 others maimed. Meanwhile, Malema said the EFF was ideologically at odds with the Movement for Democratic Change (MDC), but said the party's leader Nelson Chamisa "is an inspiration to us." 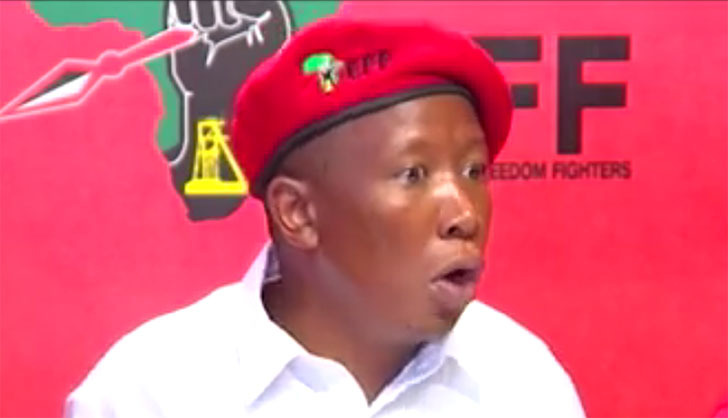 The EFF leader was addressing a news conference in Johannesburg on January 23. "We agree, actually South Africa must contribute towards the bailout of Zimbabwe. Anyone who refuses that is dumb, because if you don't help Zimbabweans the border is going to be flooded by them and anyone who is going to block them from coming to South Africa we'll fight with them. You're always complaining that there're Zimbabweans here, the only way not to have them here is by helping them in their own country. Zimbabwe must be helped. SADC countries need to come together, we need to close ranks, we must give a conditional grant dedicated to developmental programmes which will help Zimbabwe to stand on its own. A weaker Zimbabwe leads to a weaker SADC region. We need Zimbabwe. Even if we don't have money, the little we have as Africans we need to share and stop being greedy otherwise we're setting Zimbabwe up for IMF and World bank bailouts, and you know what happens. Or we are setting them up for the Chinese, who're now gradually proving to be extremely hostile where they even take assets of countries which are unable to pay them back. Let's not put Zimbabwe under such a situation. We are Zimbabwe, Zimbabweans are us. We're one thing. Their problems is our problem. Every time when you enjoy food here, you say look after your neighbours. Well, here's our neighbour, she's suffering. Who are you to say we mustn't help our neighbour if we really care about ourselves as Africans? We're becoming a laughing stock all over the world, because one of our own is swimming in a pool of debt and we're unable to provide them a conditional grant which must not end in the hands of Zanu-PF politicians. Some nonsense wrote me an e-mail and said we in Zanu-PF we support you, you don't understand what's happening here and now you're saying these things about soldiers. I said I don't care whether Zanu-PF supports me or not. What is Zanu-PF? Zanu-PF is ANC. I don't care about Zanu-PF, I'm not married to Zanu-PF. I've no relationship with Zanu-PF, none whatsoever. I care about the people of Zimbabwe. Anyone who unleashes soldiers on innocent unarmed people, you've declared those people an enemy of the state. You're a fool. You don't deserve my respect. If I allow it to happen in Zimbabwe, it'll happen here in South Africa. It's unacceptable whether it's done by Mnangagwa, whether it's done by (Robert) Mugabe it's unacceptable and Mnangagwa must know that. It's unacceptable to beat up people, to break cellphones of people. To shut down the internet is unacceptable, it's barbaric. In 2019 you've got a leader that shuts down the internet, that shuts down social media. That's so backward. It's unacceptable and Mnangagwa must know that. We are not happy with that development. We want to help Zimbabwe, we want the sanctions gone, we want a bailout for Zimbabwe but we're not going to allow the tyranny, the brutalisation of our people. That, we'll never allow. We had too much hope in the new Zimbabwe. We were so happy for our people in Zimbabwe but what we saw in the past few days is scary. Scary! So, Mnangagwa must know that we don't just support people here. Allow the people the right to protest. You increase petrol, they must march. You do all types of things they're not accepting they must march, it's their right. Mnangagwa must be very careful of that (Constantino) Chiwenga, the deputy president. That military style of leadership, if it's advocated for by Chiwenga who is a former army general, and want to convert Zimbabwe into a dictatorship, he must know he has no friend in us. We're no friends with dictators. We don't want that at all, we want good for Zimbabweans." "Bobby Wine is like Nelson Chamisa. We don't agree with Chamisa's politics. Ideologically we disagree. But the ability of the young to stand up is an inspiration to us. That's what we exist for as the EFF. We want to inspire the youth, we want to inspire the Africans to fight the status quo. So, Bobby Wine is a brother to us. We want him to fight more and he must never be discouraged by the old man (President Yoweri Museveni). Age is on his side, he must know that. Even if he doesn't win against this dictatorship, nature will resolve his problems soon. He doesn't have a problem at all, he must soldier on. If he can't defeat him through using the state institutions and democratic processes, nature will resolve the man. There is no old man who is going to win against the youth, I told (Jacob) Zuma that. I said to him what you don't know is that we've time on our side, you'll be watching us on TV while sitting in the villages there looking after cattle and we'll still be running things here. We're still running things. For sure Makhandakhanda is watching today, and we're still running today. Why? Because we have age on our side."